A middle-aged male patient presented complaining of pain in the right flank with general tiredness and ill health for the previous year. Ultrasound and CT scans were performed. 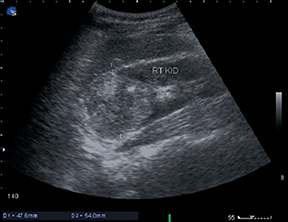 On ultrasound, a large, solid, well-encapsulated mass was seen in the upper pole of the right kidney (Figures 1 and 2). 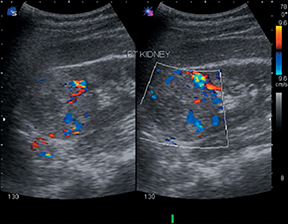 A CT scan revealed a large, solid mass measuring 5.8 cm × 5.2 cm in the posterior aspect of the upper portion of the right kidney, with higher attenuation than the normal renal parenchyma. The mass appeared heterogeneous, showing a thick and irregular rim and tiny faint calcification. The mass was causing distortion of the renal parenchyma, collecting system, and sinus fat (Figure 3). Hypernephroma (renal adenocarcinoma).The differential diagnosis includes renal cysts, renal metastatic disease, lymphoma, oncocytoma, adenoma, renal abscess, inflammatory pseudotumor, angiomyolipoma, and renal sarcoma. Hypernephroma (renal adenocarcinoma) is the most common primary malignant tumor in adults, comprising 80% of all malignant renal tumors. It usually affects people between 40 and 60 years of age. The male-to-female ratio is 2:1 and the etiology is unknown. An estimated20 to 50% of hypernephromas are associated with Von Hippel-Lindau disease. These tumors account for 2 to 3 % of all neoplasms and spread mostly by direct extension into the renal pelvis and the bloodstream; thus, early spread to the lungs is expected. The tumor involves the soft tissues of the renal sinus. Secondary deposits to the bones, liver and opposite kidney are commonly seen. 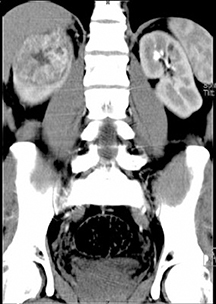 CT scan is the preferred imaging modality for patients suspected of having renal neoplasia. Intravenous urograms, ultrasound and MRI are equally good in assisting in the diagnosis and staging of renal cell carcinoma. Adenocarcinomas are non-homogenous tumors; macroscopically, they may show areas of necrosis and cystic changes as well as hemorrhage. They arise from the proximal renal tubules and they get their names and types after their cell types. The most common presenting symptoms of hypernephroma are painless hematuria, flank pain and a palpable mass. The outline of the involved kidney will be distorted and irregular. The tumor may appear on plain CT scans as hypodense, isodense or hyperdense lesions compared to the surrounding renal parenchyma. 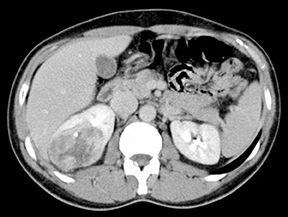 In the case presented here, the patient underwent right nephrectomy and the histopathology report confirmed the diagnosis of renal adenocarcinoma. Brant WE, Helms CA. Fundamentals of Diagnostic Radiology, Second Edition. Lippincott Williams and Wilkins, Philadelphia, 1999. Lee J, Sagel S. Computed Body Tomography with MRI Correlation, Second Edition, Raven Press, 2003. Sutton D. Textbook of Radiology and Imaging, Third Edition. Churchill Livingstone, 2003. Radiological Case: Hypernephroma. Appl Radiol. Prepared by Dr. Azouka while practicing at Al Sharq Hospital, Fujairah, UAE.